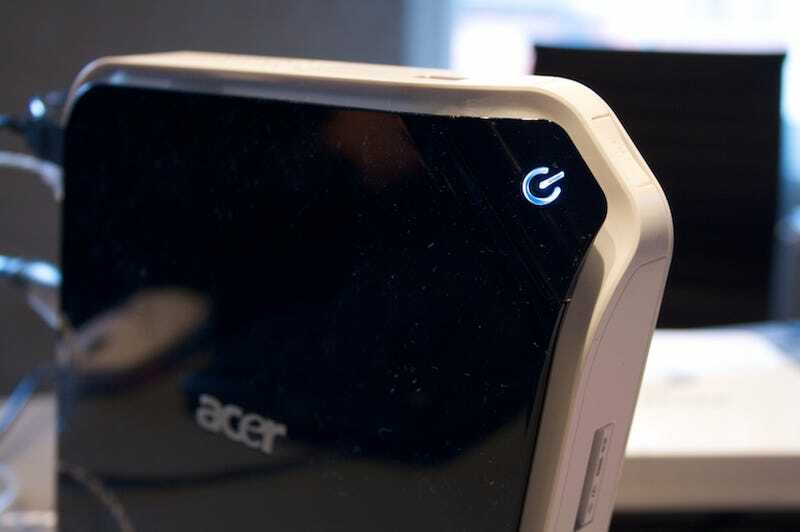 Acer's Revo, a tiny desktop that'll be "well under" $500, is the first computer with Nvidia's Ion netbook platform. Why care? Because it's got a crappy Intel Atom processor and plays HD Blu-ray movies flawlessly. Acer barely mentioned the Revo amidst its armada of cheap machines last night but after seeing what it could do, in a lot of ways, it's the most interesting because of the performance it promises to bring to cheap computers, especially if Nvidia can get all of the software ducks in a row to take advantage of its graphics platform. Ion, BTW, is just Nvidia's brand for its MC79 graphics chip (the GeForce 9400M at the heart of the new Macbooks) coupled with Intel's netbook Atom CPUs. Revo is the first announced product to use Ion. Nvidia couldn't reveal the final pricing me, only that it's "really aggressive" and "well under" $500. The demo model I got to check out was stocked with Intel's year-old Atom 230, which is by all accounts, a weak cup of sauce. But the Revo's packed with some features that potentially make it a solid TV PC: HDMI output with full 7.1 HD audio, wireless N (for streaming video), seven USB ports, card reader, and for some reason, eSATA. But let's just jump into the impressive part: It played back an Blu-ray movie with an average video bitrate of 28 megabits per second—peaking around 36—smoothly and basically flawlessly. If you're not up on bit rates, check out this explainer, but the important part is that it's a ton of data, something a regular Atom-powered machine couldn't handle without choking hard. It ran Spore, albeit at the lowest graphics settings at 1024x768, with a buttery smoothness. Google Earth ran very usably, even though you wouldn't think it was running off a MacBook Pro or anything by any means. What these apps all have in common, and why the Revo can perform with them better than standard Atom computers is that these apps all leverage graphics cards—in this case, Nvidia's—for power, instead of just using the CPU. There are limitations to the wonder, even on the video front. Since nettops and netbooks are built for surfing the internet, a fairly egregious hole right now for Ion is HD internet video. HD Hulu or HD YouTube clip wouldn't run noticeably better on the Revo than another Atom 230 computer. That's because Flash and Silverlight, the two major mediums of web video, don't use graphics acceleration yet, though Nvidia's hoping they will by the time Revo and other Ion products—of which there are at least 40 in the pipeline—ship (probably) around June, since it would give Nvidia that much more leverage in the netbook space. The other catch is that preliminary tests by other publications, showed early Ion samples delivering fantastic video performance but not so great battery life. This isn't as big of a deal for mini desktop, obviously, so a real niche for Ion machines could be cheap media PCs to plug into TVs—the Revo seems ideal for it, and even comes with a mounting bracket to snap onto the backs of TVs and monitors.